Researchers say cats may have started spending time with humans about 10,000 years ago. French scientists studied the DNA of 209 ancient cats from Europe, Africa and Asia. They included some ancient Egyptian cat mummies. DNA is short for deoxyribonucleic acid. Its carries the genetic instructions used in the growth, development, functioning and reproduction of all living things. A woman touches noses with a kitten during a stray cat adoption event organized by the Streetcats volunteer association in an attempt to reduce the number of abandoned cats roaming the street in Bucharest, Romania, Sunday, Aug. 24, 2014. 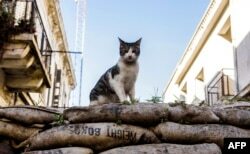 The researchers were able to follow how ancient cats moved along the eastern Mediterranean Sea from Egypt through Turkey and what is Iraq today. Eva-Maria Geigl is with the Jacques Monod Institute in Paris. She says wild cats showed up for food. "It were (was) the first farmers that invented agriculture, and this means they accumulated grains, probably more and more, larger and larger amounts of grains, and these grains of course attracted rodents and the rodents attracted wild cats." Those wild cats may have moved in fast for the rats, but human- cat relations did not develop quickly. "So it was a commensal (two-way) relationship that started to get established, but it took certainly several thousands of years until the cat really became, came into a domestic context." A previous study had found that 9,500 years ago a cat was buried next to a human on the Mediterranean island of Cyprus. The island has no native population of felines, or cats. Researchers say that means the cat was brought there by boat, and suggests it had a special relationship to the person. So as humans sailed farther away from home, cats went along for the ride. 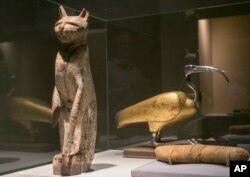 "Ancient Egyptians worshipped cats in large and Egyptian cats specifically was very appreciated to the level of being worshipped and mummified just like what they did with the Pharaohs themselves for everything that had value for them." Now move quickly ahead in time to the 1800s – to the time when people began breeding cats. That gives us all the different kinds we have today. But it has been hard for scientists to follow the process of domestication for cats. That is because fossil skeletons, the bones of cats, do not show whether the cat was wild or domesticated. The new study looked at the spread of specific cat DNA over long distances through time. It shows that people had taken cats with them as they traveled and explored the world. Results were released by the journal Nature Ecology & Evolution. Carlos Driscoll is with the Wildlife Institute of India. He says the study is the first large sampling of cat DNA going back so far in time. Researcher Geigl says they also found evidence that cats had been taken to Bulgaria by boat with the first farmers who colonized Europe. That evidence also appeared more than 5,000 years ago in Romania and 3,000 years ago in Greece. A second, different, genetic signature first seen in Egypt also reached Europe between the first and fifth centuries. It was found in a sample from a Viking trading port in northern Europe, as well as an eighth-century sample from Iran. The researchers said the cats were probably sent across the Mediterranean because they were useful in controlling rodents and other unwanted creatures on ships. The new research also shows that Persians, Siamese and Calicos have had a long and successful relationship with people, even if these cats act like they don't care. Kevin Enochs reported this story for VOA News. Anne Ball adapted the story for Learning English with additional information from the Associated Press. Hai Do was the editor. Now, test your undertstanding with this short quiz.